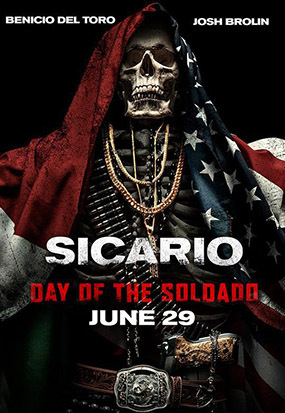 The action thriller “Sicario: Day of the Soldado” on the surface looks like a political movie. The sequel to the 2015 hit “Sicario” presents a world in which the Mexican cartels are suspected of smuggling terrorists across the border into the United States, and shows how U.S. agents respond in turn. It depicts a harrowing Rio Grande crossing in the dead of night, a car bomb at the border, a terrorist attack at Kansas City grocery store and even alludes to the U.S. president’s relationship with Mexico. But while the filmmakers wanted to portray these scenes authentically, they also actively avoided taking a political position, leaving it up to the audience to draw their own conclusions. In fact, the movie, which opens nationwide Friday, doesn’t even introduce or name the U.S. president. That helps the movie not only avoid taking a biased standpoint, but to also stay focused on a specific vantage point: the ground level operators. The apolitical current events movie has become a sort of specialty of Texas-born screenwriter Taylor Sheridan in films like “Sicario,” ‘‘Hell or High Water“ and ”Wind River,“ who creates worlds that speak to both sides of the political spectrum. Sheridan was dreaming up the story for a ”Sicario” follow-up during the first film, which became a box office hit and critical darling that went on to receive three Oscar nominations. “Sicario: Day of the Soldado” revisits some of the key characters from the first film, including Josh Brolin’s federal agent Matt Graver and Benicio Del Toro’s mysterious and ruthless mercenary Alejandro, who, faced with a new chapter in the drug war, endeavor to kidnap the teenage daughter of a drug kingpin in the hopes of destabilizing the cartels and them into a war. The production took pains to make everything as authentic as possible, shooting in practical locations on both sides of the border, including Mexico City, Albuquerque, the To’hajiilee Reservation, Laguna Pueblo, Bernalillo, Santa Clara Pueblo, Belen and Algodones. The filmmakers used local extras and borrowed military grade equipment, from forward-looking infrared thermal cameras, to Blackhawk helicopters and Humvees. “We wanted to keep the integrity of what we thought we accomplished with the first one, the DNA of it, the prestige intersection with a commercial movie,” Luckinbill said. They’re even discussing a possible third film now. There were hopes that French Canadian director Denis Villeneuve would return for the sequel, but when his schedule made that impossible, the producers found an intriguing substitute in Sollima, an Italian director who also has a background in war reporting in Kosovo and the Gulf War. Sollima approached the film and his subjects with a journalistic eye, consulting with former soldiers and going to the Mexican border himself to research what he’d be depicting. He even saw parallels with immigration in his own country, but also holds back judgment and commentary. That there are thematic crossovers with the current news cycle is merely a coincidence.